If you want to walk on a different planet and never leave Earth, go to Yellowstone National Park. It is a landscape so mesmerizing that when early explorer John Colter described what he saw there to interested parties, they surmised he was hallucinating. Painted Earth, steam billowing from waterways, bubbling pools of mud, primordial beasts... it certainly does read like a place rendered from a dream state. A visit to Yellowstone captivates with more than just beauty--it is a sensory experience gifted to all who enter. The fragrant scent of sulfur dioxide as it exits Earth's crust; warmth from geothermal features rising and enfolding you; the song of bugling elk somewhere in the distance as steam vents hiss at your feet--and of course, its visual aspects--together they command all of one's senses. You aren't just visiting you are in it. 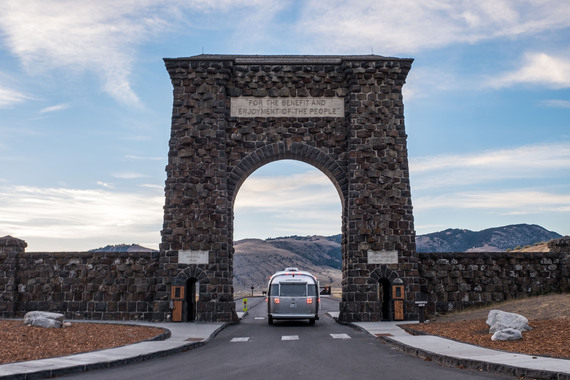 Yellowstone is a complex environment so for this article we are going to delve into the park's distinct characteristics and highlight landmarks in a place that ultimately changed how we as humans view and care for Earth's wilderness places. Yellowstone was created in 1872 in an effort to preserve its enormous wildlife populations and to divert development atop its unique geothermal features. President Ulysses S. Grant who signed the park into law called it a "pleasuring-ground," to be protected "from injury or spoilation, of all timber, mineral deposits, natural curiosities, or wonders within." Its establishment would lay a foundation for 58 additional national parks to eventually follow, and extend to 100 nations who would subsequently protect more than 1,200 parks and preserve areas spanning the globe. It was the beginning of a worldwide movement--and it all started at Yellowstone. None of this happened overnight, of course. The Great Plains, Great Basin, and Plateau Indian cultures converged in this area for millennia before Anglo explorers ever set foot there. Fast forward several thousands of years and you are in the early part of the 1800s, as word started to break to eastern America of the wonders found out west. After exploring on the Lewis and Clark Expedition, John Colter joined fur trappers on an expedition to the Yellowstone plateau and the Teton Mountain Range. He was the first person of European descent recorded to have visited the area that we now call Yellowstone. News of what he saw there spread, pushing the U.S. government to forge their own inquiry into the area. They gathered funds and sent out a team of scientific explorers including the Territorial Director of the U.S. Geological Survey, Ferdinand V. Hayden. Hayden employed the well-known photographer William H. Jackson and celebrated landscape artist Thomas Moran to create visual documentation of the area to brief to Congress, helping to push the Yellowstone Park Act that would in turn result in the establishment of America's first national park in 1872. And the rest, as they say, is history. Mammoth Hot Springs located in the northwest section of the park is often a visitor's first stop at Yellowstone because of its close proximity to the original National Park entrance located nearby in Gardner, Montana. The limestone flow formations found there were created by thousands of years of heating, cooling, and the settlement of calcium carbonate that would eventually form the most impressive example of travertine terraces found in the park. 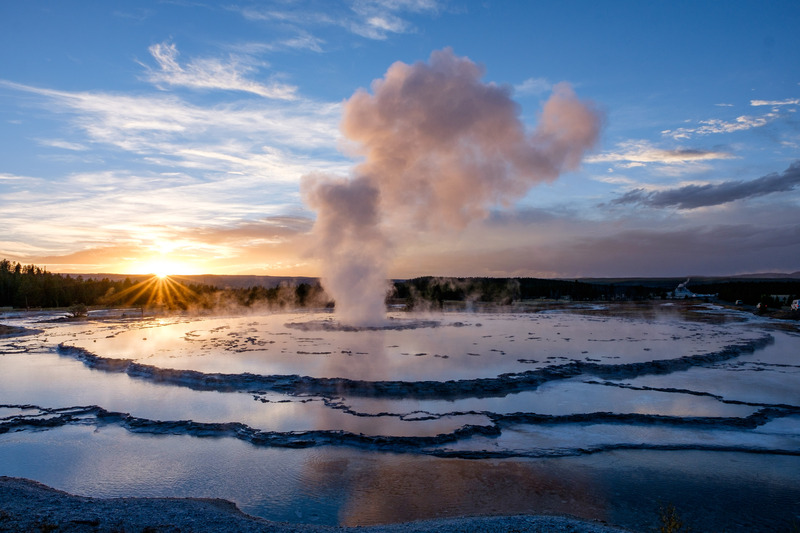 The Great Fountain Geyser in the Lower Geyser Basin is one of the most beautiful places in the park to photograph during sunset, and it is one of the few that you can drive right up to, making it an easy place to catch the late afternoon light after a busy day of viewing other landmarks in the park. 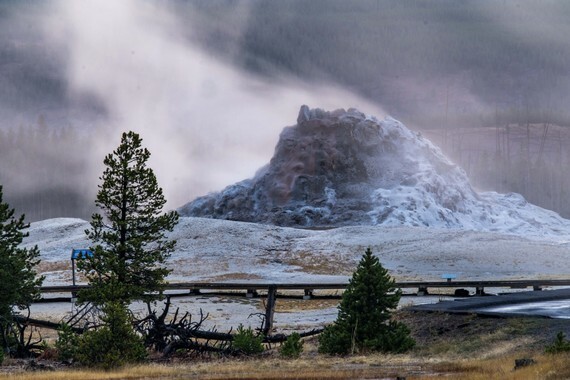 It is a predictable geyser, erupting every 9 to 15 hours. 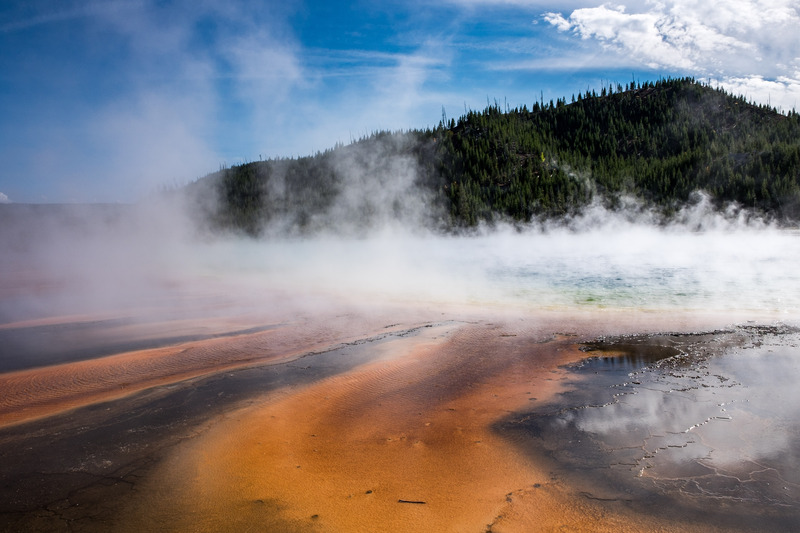 The Norris Geyser Basin is the hottest and most actively changing geothermal hot spring in the area, and its intensely colored landscapes makes it one of the most photogenic areas in Yellowstone. Grand Prismatic Spring in the Midway Geyser Basin is the largest hot spring in the United States and the third largest in the world. It is noted by geologists as it shows a full rainbow of colors found in an optical prism--red, orange, yellow, green, blue, and violet. The best view of the prism is found on the Fairy Falls Trail which is currently closed to visitors as it undergoes restoration work. In the meantime, you can capture a photo of it at ground level like we did from the elevated boardwalk, or hop in a scenic flight tour to capture a view from above. Wildlife viewing is the number one reason that more than 3 million visitors plan trips to Yellowstone each year. The park's well-mapped paved park roads make spotting animals easier as you auto-tour sections of the 2.2-million-acre wilderness. For those comfortable with the wilderness backcountry, wandering off on foot provides superb opportunities to see animals that shy from heavily-trafficked roadways. Any which way you choose to explore, you will experience a vast ecosystem containing the highest population of free-roaming wildlife in the contiguous 48 states. Hayden Valley in the east area of the park is known to be the best area to spot grizzly bears, as well as moose and elk. Llamar Valley in the central area is a prime viewing location for elk, coyotes, and wolves (which are known to be incredibly elusive and are usually spotted only from a far distance, if at all.) Dunraven Pass is at high elevation where black bears, mountain goat, wolverine, and big horn sheep are in their zones. 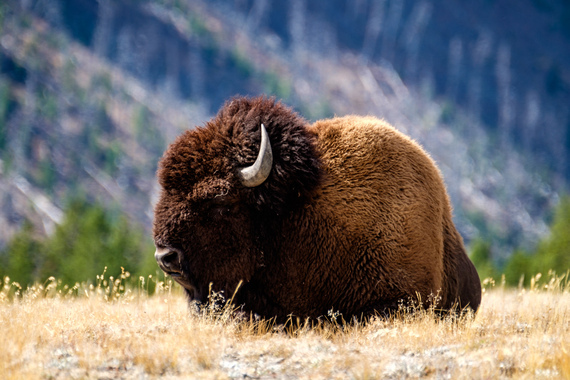 And pretty much everywhere you go you will share the road with the great American bison--which is prominently displayed on the National Park Service arrowhead logo insignia as a representation of all American wildlife. With warm sunsets upon golden grasslands, softly painted rolling hills, vast forests, and cascading waterfalls, it is easy see why this area captured the attention of many and why today it continues to endear the masses. 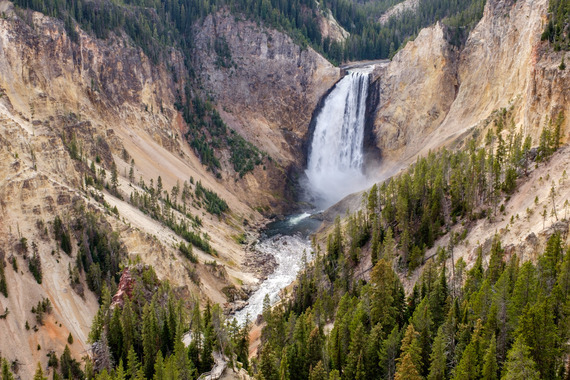 Approximately 80% of the park is covered by forests of Lodgepole pine, spruce, and fir trees that are typical in the Rocky Mountain Range where Yellowstone is located. And where there are trees and mountains, you can bet there are great hikes to set off on--in Yellowstone, there are at least 1,000 trails--bringing travelers into the fold of an incredible wild landscape where headwaters from the Continental Divide flow creating waterfalls, rivers, and streams in the lowlands. These immense waterways create a playground for anglers who travel from all around the world to cast fly-fishing rods and catch brown trout, rainbow trout, and area-favorite, cutthroat.